Of the three, I loathed two. So for dinner tonight I decided to have Broiled Tuna and two different savory Tarts. I had high hopes for the tarts. I took two sheets of puff pastry, laid them out, pricked them all over with a fork, brushed them ever so gently with some whisked egg, grated 1/2 cup of Gruyere over the top of each and gently placed these babies in a 400°F oven. 12 minutes later I removed these puffy little treats and allowed them to cool. One I topped with a mix of lentils and ricotta, then broke up 1/3 cup of goat cheese and sprinkled that liberally over the top – it sounded like a good idea at the time. 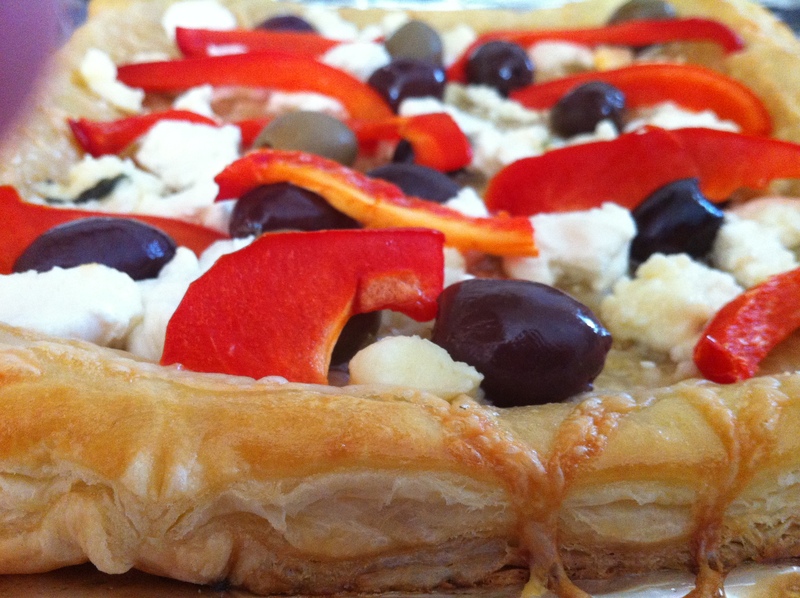 The other tart also got 1/3 cup of goat cheese, along with 1/4 cup of crumbled gorgonzola, a dozen olives (I left them whole) and half of a thinly sliced fresh red pepper. Both of these tarts went back into the oven for 15 minutes – until they were browned all over and slightly bubbly. While the tarts were in the oven the tuna steaks sat in an Olive Oil and Salt marinade, then when the tarts were out and cooling we turned the oven to Broil and shoved the tuna in. At 4 minutes, C went to flip them over and started freaking out – seems the oil caught FIRE. C managed the flames and flipped the fish. They cooked another 4 minutes or so and then we sat down to dinner. C thought the fish okay, we both loathed the lentil/ricotta tart and I had seconds of the olive/gorgonzola/red pepper tart. I think I’ll make that one again. Nice balance of salty, cheesy and puff pastry. 1/4 cup Gorgonzola **I used the good stuff from the Italian deli. 6-12 PITTED Olives **I used a mix of red, black and green that I got from the deli. 1/2 a Red Pepper, thinly sliced. 2- Lay your Puff Pastry out on a baking sheet **I recommend you lining yours with a Silpat, Parchment Paper, Tin Foil, etc. Prick your pastry all over and then brush lightly with your beaten egg. Sprinkle your grated Gruyere over the top and whack your pan into the hot oven for about 10-12 minutes. Long enough to melt the cheese and start your pastry turning brown, but not long enough to cook all the way through. 3- Crumble your Goat Cheese over the top, then the Gorgonzola. 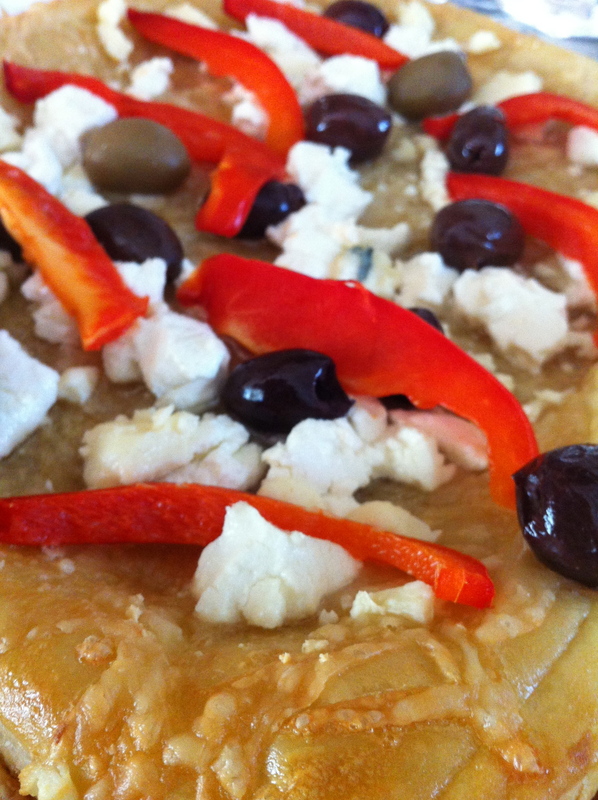 Scatter your olives across the tart and lay your red pepper slices across the top in a pretty pattern. 4- Whack it back in the oven for another 15 minutes or so, until the top is all golden brown and bubbly and smells YUMMY. You can serve this either hot or cold. You know something, this could make a lovely appetizer or picnic lunch. Maybe tomorrow I’ll take the babies out for a picnic lunch. 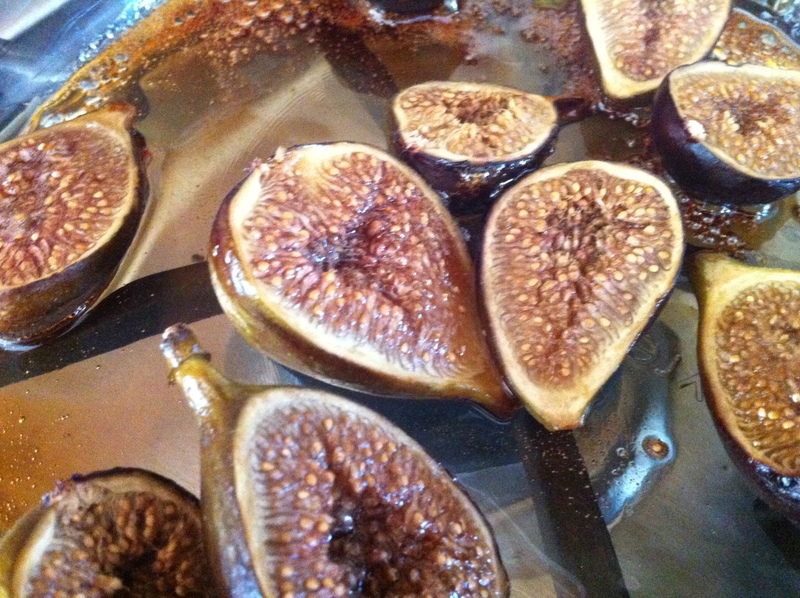 Oh, and I made C a dessert of fresh figs roasted in Silan – which is Date Syrup, kinda like Maple Syrup or Honey…but made outta dates. I was in no mood to try them, but C thought the figs good. C said they were nice. They made a pretty picture too. 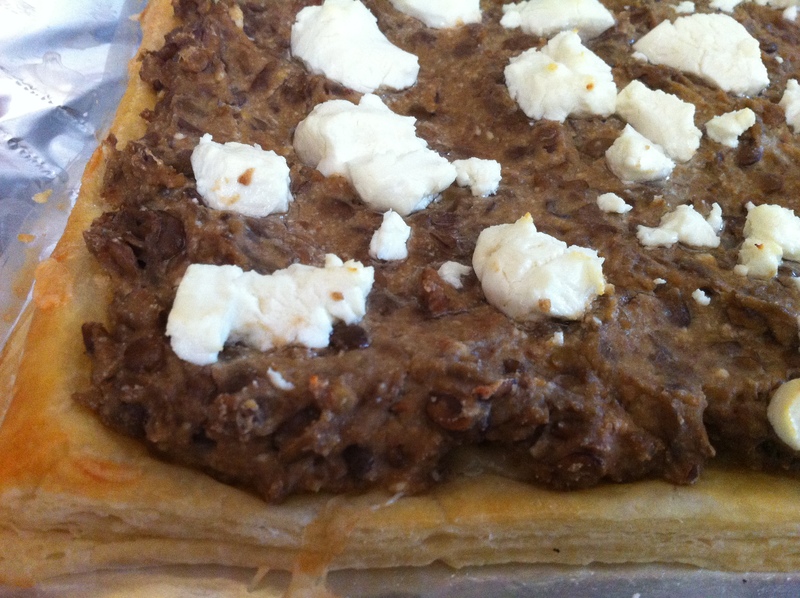 Here’s a photo of the nasty looking Lentil & Ricotta Tart.